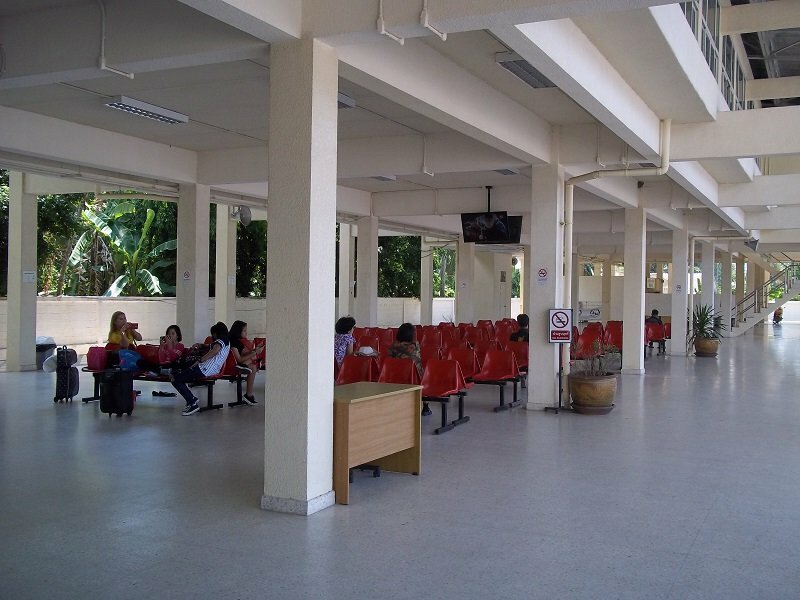 Koh Samui Bus Station is located about 2.2 km south of the centre of Nathon Town. 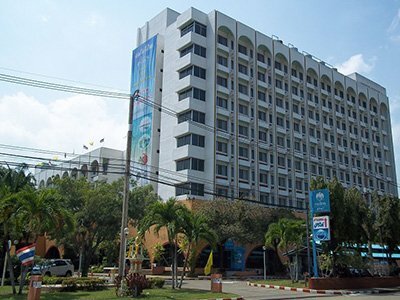 It is on the same road as Koh Samui’s main municipal hospital. Walking the journey from Nathon Town takes 32 minutes at an average walking speed, by car or motorbike the journey takes 6 minutes. The bus station has been built recently (in 2014) and is a smart modern building. 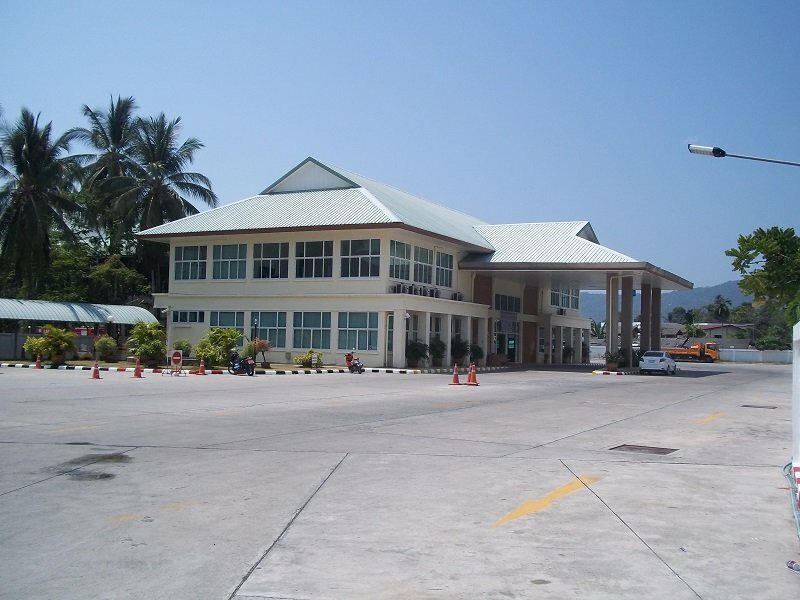 Before this new bus station was built, the island’s main bus terminal was much closer to Nathon Town. If you are travelling from Chaweng or Bophut to the Bus Station by shared taxi you will need to leave the shared taxi at Nathon town where they terminate at the car park near the ferry piers and catch either a taxi or motorbike taxi, or another shared taxi travelling South along the ring road. Near the front entrance of the station there is a ticket office area. Several companies operate out of the bus station with departures to Bangkok, Phuket, Krabi, Hat Yai and destinations in the southern provinces of Pattani, Yala and Narathiwat. For most foreign visitors the services from Koh Samui bus station they must likely to make use of are those provided by Phantip Travel, which operates the cheapest joint bus and boat connections from Koh Samui to Surat Thani town and onto Surat Thani train station and Surat Thani airport. There is a large waiting area for travellers at the back of the station. All bus services depart from a row of numbered platforms by the waiting area. Inside the bus station there are toilets and shops selling snacks and drinks. Muslim travellers can make use of the Muslim prayer room on the first floor. 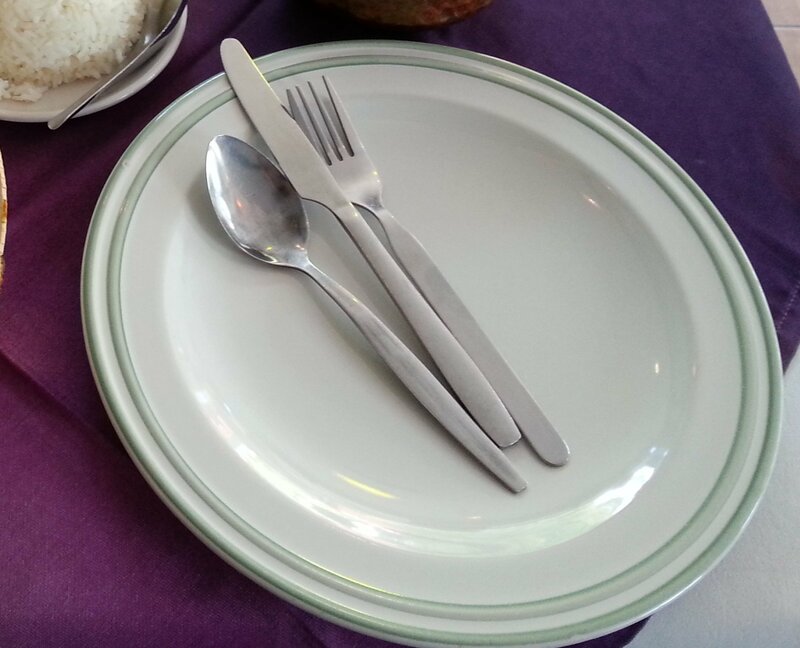 There are no other facilities at Koh Samui. If you need to buy food and drink there is a 7-Eleven convenience store 450 metres down the road from the main entrance to the bus station towards the hospital. There are two small restaurants nearby on same road. For people arriving at Koh Samui Bus Station there is a motorbike taxi stand in the car park area front of the bus station. There is a booking table positioned under the covered area of the car park. Alternatively, you can walk the short distance to the main road (turn left as you exit the bus station) and walk 100 metres to the junction. Shared taxis (Songthaew) ply this route. It is also possible to walk to Nathon town by turning left again along the main road. The walk takes about 33 minutes to the ferry pier in Nathon where you can find plenty of shared taxis and private taxis which can take you to any destination in Koh Samui. Travel Tip: For travel from Koh Samui Bus Station to Bophut, Chaweng and Lamai take a motorbike taxi to Nathon ferry pier and then a shared taxi from there. Expect to pay around 100 THB for the motorbike taxi to Nathon and then 60 THB to 100 THB for the shared taxi journey to Bophut, Chaweng or Lamai. Buy tickets for travel from Koh Samui Bus Station to destinations across Thailand using the Search Box below. There are 3 departures per day from Koh Samui Bus Station to Surat Thani Airport. The first leg of the journey is by Raja Car Ferry to the mainland and then a journey by road from there direct to Surat Thani Airport. There are 3 departures per day from Koh Samui Bus Station to Surat Thani Train Station. The first leg of the journey is by Raja Car Ferry to the mainland and then a journey by road to Surat Thani City centre for the final leg of the journey to Surat Thani Train Station. There is 1 departure per day from Koh Samui Bus Station to Phuket. The first leg of the journey is by Raja Car Ferry to the mainland, then a bus transfer to Surat Thani city centre and from there a minivan journey to Phuket Bus Terminal 2. There are 2 departures per day from Koh Samui Bus Station to Krabi. 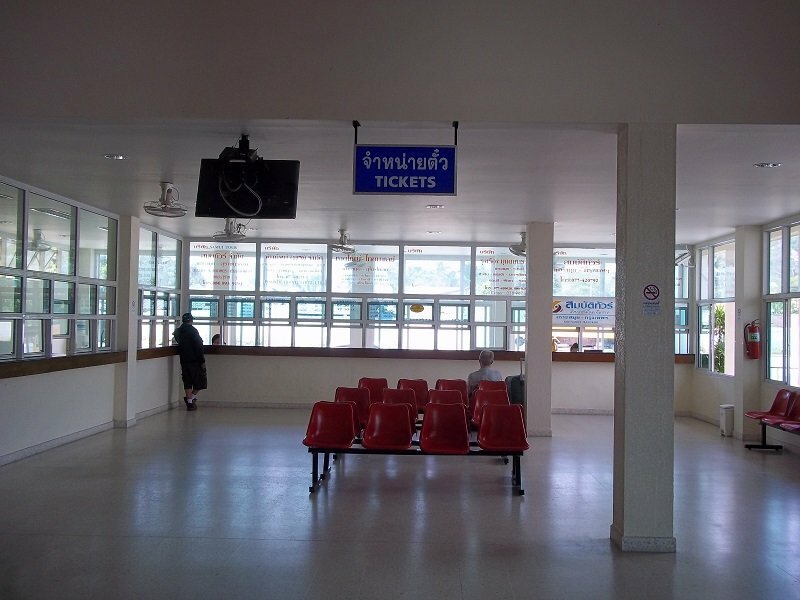 Both services terminate at Krabi Bus Station. The 07.30 services stops on route at Ao Nang Beach. Tickets to Ao Nang Beach are slightly more expensive at 650 THB per person. 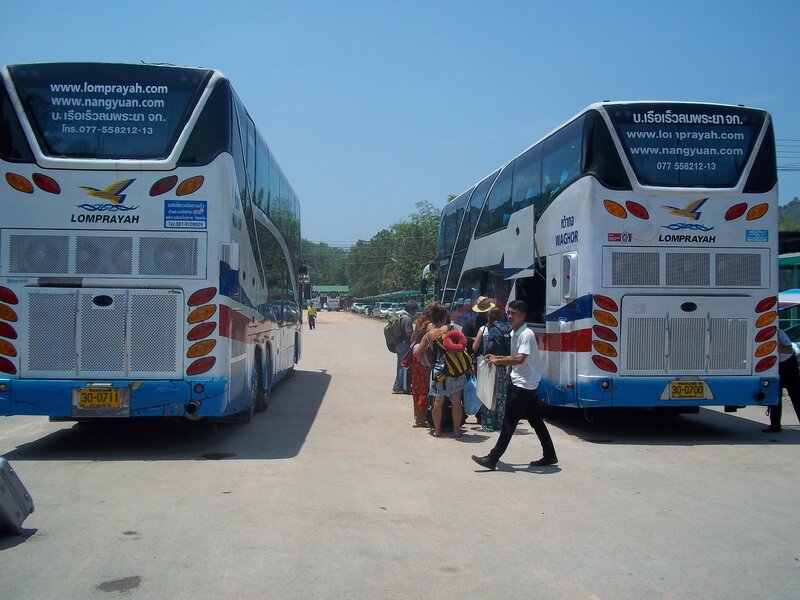 There is 1 departure per day from Koh Samui Bus Station to Koh Phi Phi. This service has fives stages: bus to Lipa Noi ferry pier; ferry to Donsak on the mainland; bus to Surat Thani city centre; minivan journey to a ferry pier in Krabi province; and finally another ferry journey to Koh Phi Phi.